Some folk say that we spend a lot of our adult lives trying to recapture the moments in our childhood when we were truly happy, before all the baggage and tangle of adult life took over. In a way that's what Joanna Cannon's book is partly about. In 1976 Grace and Tilly are ten year olds and the long summer of that famous heatwave will be that time. Not that far away in Lancashire in the same summer I was also ten and remember it like yesterday as Grace does. The two girls set out to solve the mystery of the missing Mrs Creasy. Early in their investigation they decide that consulting the ultimate witness will do the trick, so they resolve to first find God. He's bound to know. The point of view of Grace is told in a past tense first person style not unlike how Harper Lee's 'To Kill a Mockingbird' told Scout's view of the adult world, with the innocent perspective of the child armed with the vocabulary and the descriptive powers of an adult. These scenes work very well and thoroughly charmed me. She evoked the era by peppering the narrative with brand names (mostly gone now), tv and loads of other cultural stuff synonymous with the era and the place. Perhaps there was a little too much consumption of the Angel Delight though at least I'll remember what my tea towel is called. What lets the book down to a degree is the fairly dull third person accounts of the adult's POV both in 1976 and the frequent flashbacks of 1967. Unfortunately the story would hardly progress without them so they are necessary goatishness . The bright whimsy of the young duo make most of the adult character's existences all the duller in contrast. 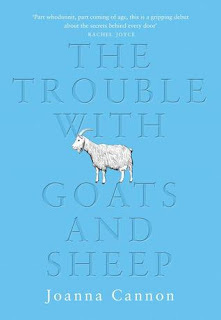 The Trouble With Goats and Sheep is that the goats just aren't as good as the sheep. This review was of an Advanced Reading Copy provided by Harper Collins. site moved! - HEY ALL! katiecandraw.com has moved to https://katiecandrawblog.wordpress.com/ please update your bookmarks! © 2009-2015 Badelynge All Rights Reserved.